This explosive exposé reveals what the biotech industry doesn’t want you to know—how industry manipulation and political collusion, not sound science, allow dangerous genetically engineered food into your daily diet. Company research is rigged, alarming evidence of health dangers is covered up, and intense political pressure applied. Chapters read like adventure stories and are hard to put down: - Scientists were offered bribes or threatened. Evidence was stolen. Data was omitted or distorted. - Government employees who complained were harassed, stripped of responsibilities, or fired. - Laboratory rats fed a GM crop developed stomach lesions and seven of the forty died within two weeks. The crop was approved without further tests. - The only independent in-depth feeding study ever conducted showed evidence of alarming health dangers. When the scientist tried to alert the public, he lost his job and was silenced with threats of a lawsuit. Read the actual internal memos by FDA scientists, warning of toxins, allergies, and new diseases—all ignored by their superiors, including a former attorney for Monsanto. Learn why the FDA withheld information from Congress after a genetically modified supplement killed nearly a hundred people and disabled thousands. Jeffrey Smith has worked in the field of GM foods for nearly a decade—with nonprofit and political groups and at a GMO detection laboratory. His masterful writing style captivates and charms, while his meticulously documented facts leave no doubt about a massive injustice. Eating such experimental food is gambling with your health. Find out how you can protect yourself and your family. 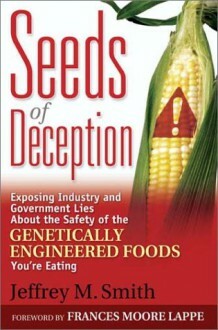 Well written and easily understood book that illustrates the industry and government lies, coverups and intimidation regarding the safety of genetically modified food. My favourite book on the subject of GMO. I especially recommend the "things that can go wrong" section.